This luxury detached villa is located in a quiet residential area and is beautifully furnished. The modern bathroom and full kitchen make the house complete with all the modern conveniences. The large enclosed garden with diverse fruit trees provide complete privacy. Enjoy the peace, the nature and the beautiful private swimming pool. The children can enjoy the swimming pool, and also the Foosball and table tennis. Only 1.5 kilometers away, you have shopping and nice restaurants. The village called Trecastagni, is located on the southeast slope of Mount Etna, where much wine is produced, thanks to the fertile land. Trecastagni is located in the middle of the famous wine route. Besides the many wineries, there are also several, organized excursions on Etna, so you can, for example, go on a jeep ride or climb Mount Etna on foot or horseback. Famous cities such as Catania (20 km) and Taormina ( 40 km) are definitely worth a visit as these towns have a rich history, beautiful statues and cozy cafes. Taormina consists of two parts. The low-lying coastal area and the elevated old city center -- a cable car transports you between them. Lets immerse yourself in luxury. Villa Trecastagni is a very suitable villa. 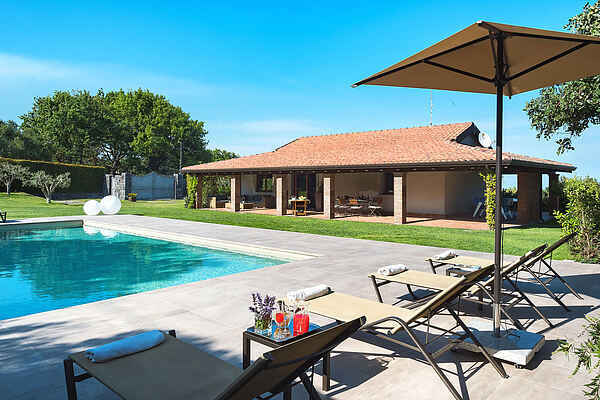 With a glass of wine in your hand on your lounger on the edge of your private pool watching the beautiful fenced grass garden. The garden has many fruit trees; oranges, apples, pears, plums, lemons, tangerines, apricots and even olive trees. The children have fun on the tablefootball and table tennis. And as the evening sun goes down and the garden lights turn on, you can continue to enjoy this place and cook a fish on the BBQ in the outdoor kitchen. The fairy tale is complete! You would almost forget that you're in Sicily, an island with great history and beautiful sights. Fortunately, this villa beside comfort, has a highly strategic location on the southeastern slope of Mount Etna so you can easily admire the Natural Park of the vulcano. There are many excursions to the craters. For example, you join a jeep tour that follows the route of the cable car that was destroyed by an eruption in 2001. In fact, many wines are produced in this part of the Etna The land here is extremely fertile. Famous cities such as Catania (20 km) Taormina (40 km), Siracusa (80 km) and Ragusa (120 km) are also within easy reach for a day of culture. Catania has many shops, terraces and squares. Taormina and Ragusa are known for the good atmosphere on the beach. Restaurant and grocery 1.5 km. Bank, supermarket and other restaurants 2 km.